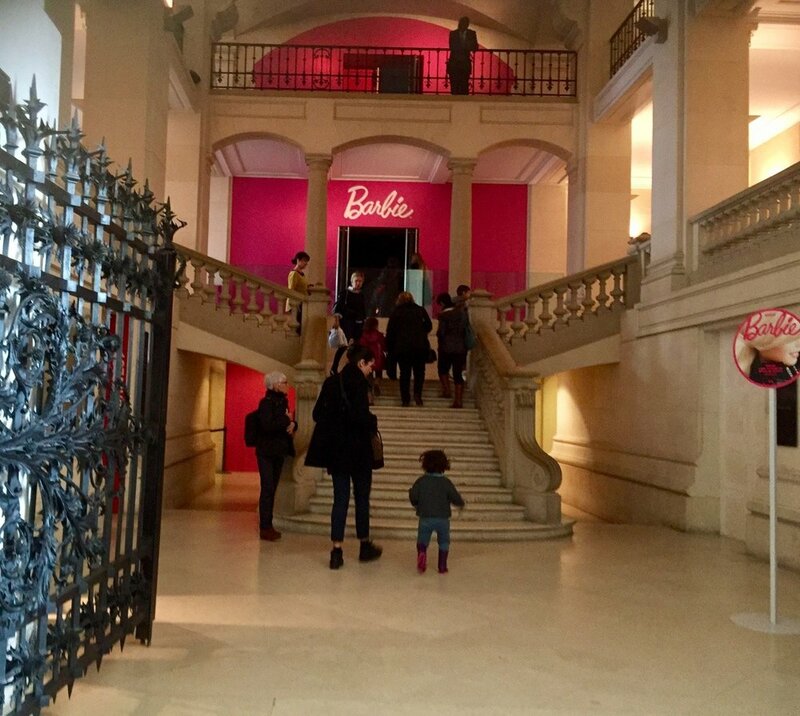 Pictured: A museum exhibit on Barbie, a quintessential feminine identity that fractures the female population, that I visited in Paris, April 2016. I have never seen the movie, Mean Girls. I don’t want to either. I remember in high school, the vice principal - aptly named “vice” as opposed to virtue, had announced over the loudspeaker that a Burn Book was passing around, the vicious contents of which would not be tolerated. I caught a glimpse of the girl with ripped Abercrombie jeans and a tight crop top that somehow made it past school security’s roving eyes. She was smirking and looked at the other Eastern European girl in their clique. All that said, they were always nice to me and everyone else actually. The truth was, they were mean to each other. It was a vicious incestuous crowd. They were their own best friends and own worst enemies.The scenario was also too reminiscent of the phrase, keep your friends close and your enemies closer. In high school, we were not permitted to wear footwear without backs, or slip-ons. Skirts couldn’t be shorter than the length of our extended arms and fingertips when placed by our side. The consequences were dismal: demerits, detention, suspension - the list goes on. I attended a strict selective school where taking classical Hebrew, Latin, or Greek was mandatory and physical education was taught by a national black belt karate champion. Think Chilton from Gilmore Girls. This past Sunday, I was down. My mental space was filled with negativity. I felt upset about the hurdles and roadblocks life had hurled at me, flung at me, giving my emaciated body a dose of whiplash that made my head spin and ears ring - literally. Although the ringing has lessened since I have remained home bound and eat more, circulation is still not up to par as it would be with one who isn’t so underweight and doesn’t have anorexia. I was arguing with everyone at home and when we went outside, I had no desire to be around them, but knew that they were my only means of venturing into the sunlight. I was crying silently, sneaking a minute here and there to wail audibly in the parking lot of the shop they went in. It was like I was a chain smoker- addicted to that need to let it all out, alone, because who could understand? Addicted to that need to feel the air and the outside world; not to be shunned by car emitted, store and home controlled-air conditioning. Addiction is unhealthy. You may be thinking that the addiction to enjoying natural elements and not burdening another human with my profound sadness by letting it all out, is healthy. These actions are certainly not destructive. But the idea of them being addictive, happening repeatedly, is negative. I shouldn’t be forced to sneak in a minute outdoors. I should spend anytime I want outdoors, without having to check my watch or look over my shoulder, or ensure that I don’t purposely walk at a speed walker’s pace to burn off calories when I need to be consuming a good thousand more calories than I do to gain weight. I shouldn’t be crying, feeling down, and grimacing at the unfairness of having an eating disorder that took away my life as my friends get engaged, married, move up the career ladder, become athletes, and travel. I’m addicted, it seems, to believing that I am not deserving of anything. How I wish to feel that sensation of coming home after a long day out, at work. I remember giving myself spa days at home. I remember allowing myself to watch television to unwind or a movie. I am in silence all day instead and my feet are bruised more than they ever had been when I was actively dancing for over 40 hours a week. I’m addicted to projecting into others the self-care and self-love I want and do deserve despite not having an income and only focusing on my health. This Sunday, I gifted to the person who was giving me hell from morning till dusk, even into the next day, and for many days before and after, a manicure and pedicure spa treatment. If there is one luxury I absolutely love and fully believe to be worth it, it is a pedicure. That soothing feeling of exfoliated legs, microbeads caressing ravaged pores and dry skin from shaving, bubbly warm water bouncing effervecently around my toes and jet streams of tepid waves molding around my foot beds, make me swoon. I don’t deserve a pedicure. It’s not like I travel to and from home or that I am consumed by work. It’s not like I dance for hours or pursue academia. I’m only working towards my health- recovery. That word is loaded. Recovery connotes something positive and desired, but it comes with a load of discomfort and struggle. I constantly cradle back and forth on a fulcrum. I voluntarily make a 3-hour-long feast for my parents’ dinner, forcing myself not to move around. I feel my veins pulling all over my body and though I know what it is, each and every time I fear for my life at the sensation and start to eat as if I would suddenly become weight-restored, only to feel full and immense regret thereafter. She’s a mean girl, and I am too.